Hiring is a great decision for any organization. A wrong selection of a single candidate can lead to greater problems as the companies invest a lot in recruiting the employees. And a wrong candidate can lead the company to wrong path. This is the first thing on basis of which you can recruit the candidate. The qualification should match the benchmarks set by your company. Do not compromise on the education qualifications. Even if you select a candidate ignoring the qualifications then, it will somewhere affect your company’s work only as the things read in the university or the college is related to the practical work required in the work place. So do not ignore it at any cost. The previous experience is the basis and forms the foundation to work further for the candidate. So, must check and if possible re check by taking the examination or test to know whether the previous experience has led to some gain or no. Even if you have a fresher candidate, then also you can calculate the experience as the fresh pass out must know the basics of everything. The candidate must be enthusiastic and very energetic. The lame and lazy person ofcourse would not be acceptable so why even for you. Just choose a candidate who is ready to work and take initiative with full enthusiasm. The lazy candidate will only let your company go back as neither he or she will do any work nor the company would be able to give up on the candidate before the completion of the project. The candidate must have good communication skills. What if the candidate is not able to communicate properly and you hire that person and the person afterwards is not able to speak well then it will only insult your organization in future if you present him or her infront of the outsiders. So, it is better to judge the candidates on the basis of communication too, as it is the key for every small scale and large scale organizations. If a person is not able to present himself in front of number of people then there is no use to select such a candidate for the job. The body language should be good. Good here means it should be smart. The person should carry a smart and attractive body language. The lame walk and the lazy habits of a person should not be given any attention. The wrong body language may lead to embarrassment at the conferences or the presentations. So, make sure the candidate possesses a good and attractive body language. A lame person is never accepted or given an opportunity because every lame individual would rather find an excuse to rush away from the work rather than taking an initiative for the work. Even if you judge the candidate on the basis of the communication skills you might ignore the non verbal signs which is not good. So, never ignore the non verbal signs as they say even more about the person than what the tongue speaks to the person. You never know, the candidate might not act well through his or her actions while communicating. Such things make the situation awkward. So, it Is better not to let go of the non verbal signs. The person might not get promotion overnight but yes, leadership skills are essential even if the candidate is required for lower position. This is because someone is still required to manage and execute the lower level employees too. So, for that purpose also, the candidate must possess leadership skills. Also at higher levels too leadership skills are important. Infact at all levels, such skills are necessary. The candidate must have skills to handle the customer. The skill of customer handling is important as the company runs on the basis of it’s customers and the clients. If the candidate is not able to handle it’s clients well then there is no use of such a candidate. The interview panel list must recruit the candidate on this basis of client handling skills. Lack of client making and customer building will only lead to company’s downfall, so do not hire a person who can lead to negativity instead of positivity. The technical abilities here refer to the ability to handle the technicalities in the office. Nowdays every company whether small scale or large scale, have technical things to operate for example computers and laptops. A candidate must have basic knowledge of how to operate the computers, the basic softwares should also be known to the person. If the basic things are not familiar to the person then the company would have to spend extra time in making the candidate understand the concept, which is rather just waste of the time, effort and money. Do not recruit a fussy candidate as he or she might refuse to work in a team. Working in a team is bit difficult as the team may have candidates who are unwilling to work. So working with such people is a task. If you do not want your team to work in unison, make sure you get the candidate who has the ability to work in a team. Every company works in a team. Every company has a commom goal to achieve and if the candidate is not able to work in a team then it would affect the working of the company. So, this is also one factor on the basis of which one should rate the candidates. Every company confronts with the problems and the company wishes the employees to have an ability of problem solving. If you select a person with no ability to solve the issues within the company then the company might have to suffer the brunt. The crisis management is one thing that the companies wishes the candidates to know, so make sure the candidate you choose is having the ability to manage the crisis too in the company. The candidate must be friendly with everyone. The lack of friendly nature may result in fights and issues within the company which is not at all appreciated by anyone, neither the company nor the employees within the company. The work atmosphere should be friendly and if the work culture can get affected by the candidate you hire, then it is better to pass on the position to next candidate. So, it is better to rate the candidate on such basis too after the interview is done. The one who is laid back and is not willing to take an initiative should not be recruited to the job. The candidate must be quick and willing to take an initiative. He or she must not be lazy both in terms of taking and delivering the work. The candidate must have a professional approach towards the work. The style of doing the work and also the approach towards the work should be professional. If you are finding the candidate having enough professional approach then it is better to have him or her into the job. This point is the most important one to be taken into the consideration as this is one thing which every company demands from the candidates. How much a candidate is knowledgable should also be the basis to rate the candidate after the interview. The knowledge about the subject is important but apart from that the knowledge about the world and the competitive companies is also very essential. If you think the candidate is not having enough knowledge then it is better to rate him or her accordingly or it will be wastage of time to both the company as well as the candidate. How the candidate treats the ones who are superior to him as well as who are inferior to him or her, should also be the basis to rate after the interview. Every candidate must have compassion for both the lower class as well as upper class candidate. This is important because every company works with the combination of lower as well as upper class candidates and if the new candidate fails to treat the lower rank employee in a respectful manner then he or she must not be there in the list of the ones who are selected for the interview. Look at the candidate’s attire. 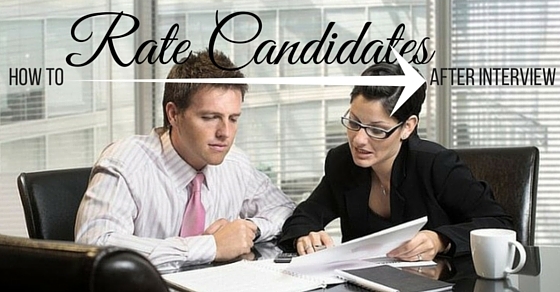 If it is formal, then you can rate the candidate as per the situation. Make sure the candidate is not in funky or vibrant colors for the interview, it is not at all demanded. Also have into consideration the attire. The candidate must know what is the work during the office hours and what is required after the office hours. The candidate must have an ability to understand the concept. More importantly, he or she should have great grasping power. This quality of understanding the novel things is something worth appreciating. So, if you find such quality in the candidate, hire him/her. This can also be one of the factor to rate the candidates after the interviews. The candidate must be able to accept his or her faults if any mistake is done. It is also important because not everyone accepts his faults very easily. If a person has the quality of accepting his faults and finds himself accountable for the issues if created then it also becomes a criteria for judging the candidates after the interview. Sometimes the candidates are careless and irresponsible. The one’s whom you find are irresponsible and careless should not be selected after the interview. The irresponsible behaviour can be easily judged as many times the candidates fail to bring important documents. So, this can be the basis on which candidates can be rated post interviews. If the procedure of interviewing involves some test, then it can also be the focus for selection process of the candidates. The one who performs well in the test is obviously rated good but the one who does not perform well should not be rated bad as many times the toppers are bad at the practical work and the average candidates grow even more good than those who top. So, this can also be one of the factor to rate the performance of the candidates after the interview process finishes. So, above are some of the points on the basis of which the candidates can be rated after the interview. The candidate must not be rated on the basis of one factor. Everyone should have the combination of all the factors, only then it would be possible for the company to choose the best. Before the final interview, various steps take place and the evaluation should be done on the basis of each step during the interview. The company although chooses the best candidate for themselves but sometimes it also becomes a difficult decision for the company. In order to make the whole process simple just judge the candidates on the basis of above qualities and you will find the expected candidate for the company. Previous articleHow to Introduce yourself in Interviews the Right Way?